Every month there is an estimated twenty species of new flora and fauna located on Planet Earth. 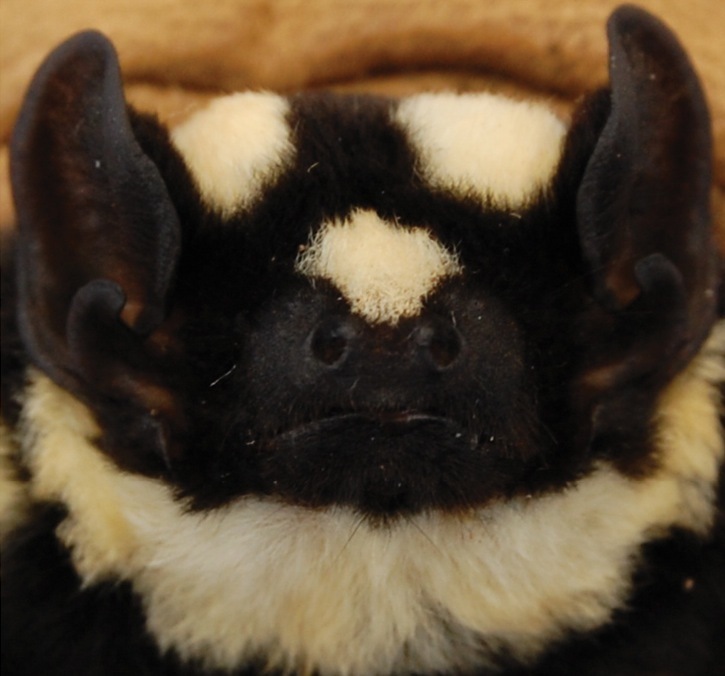 However back in 2013 scientists from the University of Bucknell University and Fauna & Flora International located deep in the heart of South Sudan a new bat species commonly named as the Pied Bat or Badger bat. And what a stunningly beautiful bat this is too which oddly does look identical to the markings of our Chinese Panda. The scientific name related to this species of bat was thought to be related to the Glauconycteris superba which for now thankfully is listed as [least concern] on the International Union for the Conservation of Nature’s Red List identified back in 1939 Dr Haymen whom was the first to discover this particular species of bat. However the new “genera” pictured was discovered in 2013 DeeAnn Reeder, an Associate Professor of Biology at Bucknell. This species of Pied bat (Glauconycteris superba) was bordering endangerment back in the mid 1990’s of which from 1996-2004 was listed as [vulnerable], to date though its population trend or how many Pied bats actually exist is currently unknown. So whats the news on the “Panda bat” as its commonly named? 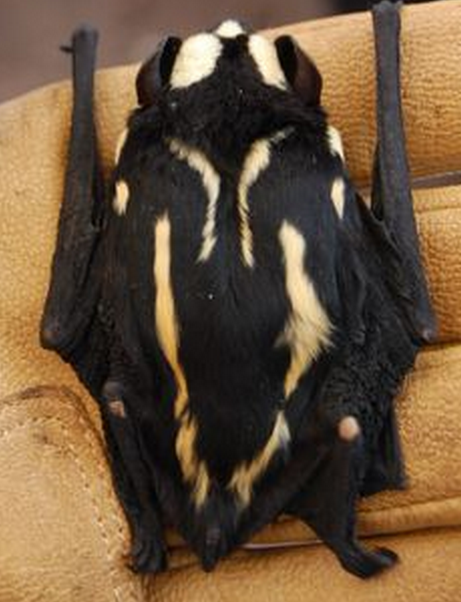 This is a special bat, and not just because of its strikingly beautiful spots and stripes. This is a rare specimen, whose discovery in South Sudan led researchers to identify a new genus of bat. The bat is just the fifth specimen of its kind ever collected. DeeAnn Reeder, an Associate Professor of Biology at Bucknell and first author of the paper announcing the new bat genus, recognized the bat as the same species as a specimen captured in the Democratic Republic of the Congo in 1939. That specimen was classified as Glauconycteris superba, but after detailed analyses she and her colleagues determined it did not belong in the genus Glauconycteris. It was so unique that they needed to create a new genus for it. Reeder and her colleagues named the new genus Niumbaha, which means “rare” or “unusual” in Zande, the language spoken in Western Equatoria State, where the bat was captured. The bat’s full scientific name is Niumbaha superba, reflecting both the rarity and the magnificence of this creature. “Our discovery of this new genus of bat is an indicator of how diverse the area is and how much work remains,” Reeder said in a press release. So what’s the news on this species of bat? Well firstly we can state that this species of bat (Niumbaha superba) although not the same genera was primarily located by Dr Haymen in 1939 Niumbaha superba oddly is not listed on the International Union for the Conservation of Natures Red List of (threatened species) as this newly discovered genera is listed as [vulnerable] wheres its relative Glauconycteris superba is listed as least concern. The pied (panda bat) is found in the Democratic Republic of the Congo, Ivory Coast, Ghana and South Sudan, the genus Niumbaha was identified by Reeder, Helgen, Vodzak, Lunde & Ejotre, in 2013. The species lives in natural habitats, tropical or sub-tropical rain-forests or tropical moist lowland forests. To date we are only aware that the current threats surrounding this species is habitat loss. However this soon could change of which threats from hunters hunting for the bush meat trade could see the species pushed into extinction. Habitat loss or habitat fragmentation is playing quite a pivotal role with regards to many species of bats declining worldwide. However other species of bat that normally roost in caves seem to be less threatened by such habitat human disturbances. Bats make up a quarter of the mammalian diversity on the planet, and they are the only mammal that can fly. The African continent and Madagascar and its associated islands contain about 258 extant species of bats, which comprises about 25% of the global bat diversity. Bats are an important component in ecosystem health and condition. They occupy a critical niche, the insectivorous species being primary nocturnal predators and are susceptible to increased levels of pesticides, while frugivorous species are critical for forest regeneration. Many plants are dependent on these night time visitors (e.g. Baobab), for both pollination and seed dispersal. 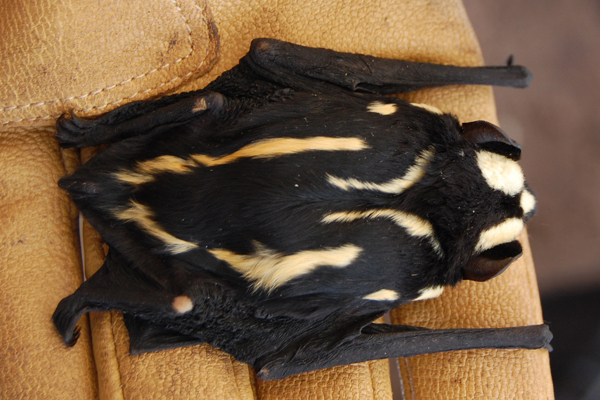 Both groups of bats are also greatly susceptible to environmental change especially Niumbaha superba. The effects of habitat and climate change on these species are unknown, and if so, there is much speculation as to the impacts, both positive and negative. These impacts on bats have a direct impact on food security and human related zoonotic diseases. What is of primary concern is that we know very little about the distribution, abundance or the biology of the various species. Also from a cultural perspective, bats are perceived by most African cultures as associated with dark and evil magic, and are persecuted. Within western, north and the Central African Republic (bats) are hunted and eaten of which this year has been linked again to the worlds most deadliest virus – Ebola Hemorrhagic Fever (EHF). While hunting though plays a threat to the decline of bat species habitat fragmentation is most certainly the largest threat to the all species/genera. Because bats have low reproductive rates, populations are very susceptible to elevated mortality or depressed recruitment. There is scientific concern about the conservation status of bats as many species of bats are increasingly affected by multiple actions of humans such as ignorance, suspicion, pesticide poisoning, roost destruction and closure, habitat loss, over-exploitation, and extermination as pests. Avoid disturbance of bats in caves, including the lighting or use of fires in caves. Some bats have moved into residential areas because human expansion has resulted in loss of habitat, forcing bats to look for alternative roosts in which to live and raise their young. And of course while we know habitat loss is currently a threat to this species of Niumbaha superba other threats could/will also play a role in its decline that could evidently see this new genera of bat killed off. These these threats are as you may have guessed “human made up myths”.. The incidence of rabies is rare. Bats are not aggressive and will not normally attack people or pets. South African bats do not feed on blood. (Vampire bats, which do feed on blood, live in Latin America) and the feasting on blood is mainly of cattle or other large mammalians – although there has been some very small isolated rare cases of Vampire bats attacking humans and feeding of them. Again this is (extremely rare). So what else do we know about Niumbaha superba other than the threats currently facing the species, future threats and habitat degradation? Niumbaha superba is an insectivorous bat meaning it feeds primarily on just insects, insectivorous bats are critically important to the environment as they help keep pests in control that would otherwise if not controlled damage vast swathes of crops, trees, plants and invade human populated areas. Insectivorous bats are also very important to humans as they help keep mosquitoes in check that endanger human life by the spread of Malaria which is known to be one of the Africa’s largest human killing viruses in. 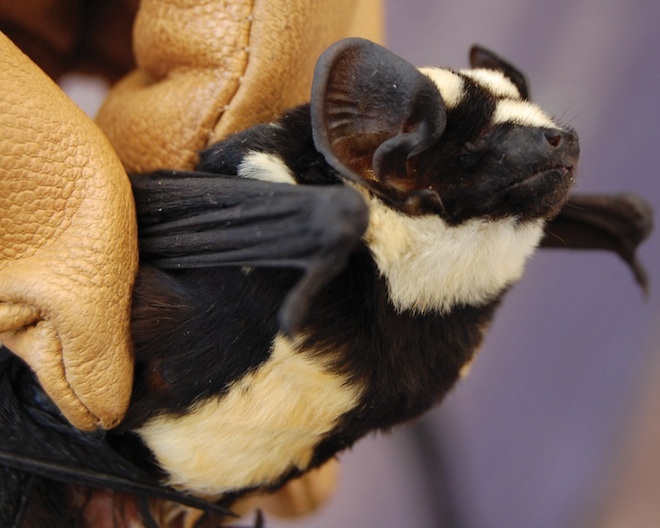 So if ever your in South Sudan do keep a lookout for this stunning and most beautiful bat commonly named as the (pied bat, little badger bat, badger bat or panda bat). For more information on African and international conservation projects please view our Facebook page below. This entry was posted on November 12, 2014 by speakupforthevoiceless. It was filed under You must be the change you want to see in the world and was tagged with Niumbaha superba, South Sudan.